A sure sign the real estate market is on the mend is that nationally, 2012 has seen the most new home building activity since the market highs of 2005 – 2006. Here in East Cobb builder activity, driven by East Cobb’s top three public high schools Walton, Lassiter, and Pope, has been just as brisk. 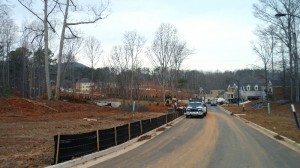 In the Lassiter High School District, local speciality developer, Brooks Chadwick developed a large wooded tract of land for a new subdivision known as Mountain Creek where homebuilder Lennar is building 48 new homes priced from $500K. In the Pope High District Lennar added a final phase of about 20 new homes (on smaller lots) to the existing Waldon Subdivision built in the 1990′s. Lennars new addition is named “The Estates of Waldon” also priced from $500K. For information on new home developements, help finding a “buildable” lot, and available builder bonuses in the Lassiter High School District or anywhere in East Cobb or North Atlanta, contact Robert Whitfield at 678-585-9691. Check out all the highly specialized new construction services to protect your sanity and assure a smooth process if you are planing to buy or build a new home. Unlike ordinary agents, Robert has advanced experience and qualifications to assist buyers with every facet of the new home construction process and has successfully dealt with architects, engineers, custom builders, volume builders, and site superintendants on behalf of clients desiring to make a new home purchase and/or build a new home. Robert can assist clients in all matters ranging from lot selection assistance, builder meetings, upgrade and component package selection, ongoing construction monitoring from the ground up, or at any stage, to attendance at walk through, pre-drywall inspection, advice and consulting on construction alterations and repairs that are sometimes required, final walk through and release, to closing and beyond. Roberts works in a collaborative way and assists clients with many other matters that are a necessary part of real estate transactions. In addition to a background in home building and building structural analysis, new construction monitoring, and environmental testing, Robert also offers his clients great services like impactful HDR photography and video services. Contact me with any question you may have about East Cobb or Atlanta real estate. I stand ready to proved unmatched assistance with your home buying, selling, or building needs.